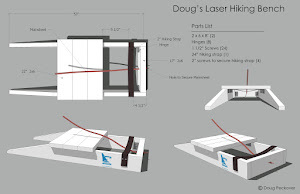 Doug is sending out his race journal by email to those who have asked to be copied. I'm volunteering on the finish line boat on the standard course. Volunteers received a couple of nifty hats, free lunches, invites and free tickets to all the evening events. They take good care of their volunteers but we're working for it to. We start early each morning with a volunteer meeting, then man the ramps and organize dollies and then we're off to set the finish line and take scores, then back to the ramps for any stragglers, followed by a de-brief at the end of the day. I only thought I was on vacation. But, I like being close to the action with the opportunity to take pictures and videos. Here are the ladies of the finish line ... Judy, Helen and Jill. Three very competent and fun women. Ian is our driver/mentor and we interrupt young Andrew from naps and video games to help with marks, anchors and finish line spotting. Jeff Martin is the PRO for the radial fleet and a really cool Aussie named Hugh ? is the PRO for the standard fleet. The emphasis for the regatta every single day is safety. They have a contingency plan for just about every situation imaginable and every boat doubles as a safety boat and we've even been briefed on technique for getting helpless sailors out of the water ... turn them around, push them down hard and when their head goes under, they kick instinctively and their PFD also pops them up so that we can haul them in by the life jacket. That was a new one for me. Hugh does an incredible job of staying on top of everything on the standard course. If there is a straggler or a mixing of fleets, we know it before they get to us. We give him finish times and he adjusts starts times to keep the fleets just barely separated. There is alot of coordination going on throughout the racing to keep things moving smoothly. Here are a few glimpses of the chaos on the finish line ... note the rocking of the boat ... we're writing, filming, calling all while trying to stay upright as the fleets come through. Comment from Doug: you'll notice boats tipping just below the finish line. When a gust hits, it can be a sudden lift or a knock that will put you in the water. It's easy to misread when pushing it at the end end of a race. Calling those numbers becomes really hard when a boat finishes so very close to the boat end and blocks the view. Hi Pam, I really enjoy your (and Doug's) posts & positive approach but may I respectfully take issue with the "new" recovery method you mentioned. Here in the UK we dropped this method over 20 yrs ago: " turn them around" - if you try to pull somebody in with their back to the boat/gunnel, you risk damaging their spine. 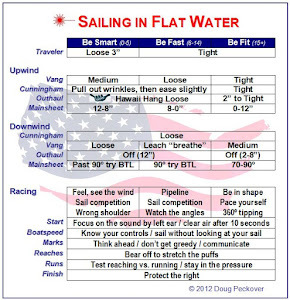 Casualties should be 'rolled' into the boat either face forward or sideways, "push them down hard and when their head goes under, they kick instinctively" - not if they're not fully conscious/ in shock; they're more likely to have a slack jaw and swallow a lot of water, potentially leading to secondary drowning. " 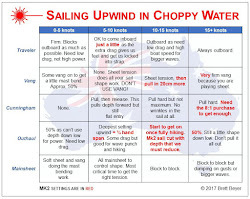 and their PFD also pops them up so that we can haul them in by the life jacket" - no, sorry but no again - if you pull them by the PDF/lifejacket you will eventually end up with an empty lifejacket on the deck and an unsupported sailor still in the water. When was the last time you counted the number of sailors who don't use crotch-straps?. "That was a new one for me." Hopefully one you'll forget very quickly - the best method will depend on the recovery vessel but strops and ladders are good for hard-chined vessels, and both feet over the sponson (tube) and drawing the casualty in a 'tuck' position for a RIB. Oh, and keep an eye on them once they're on board the safety boat - I had a fit young man go hypothermic on me last weekend in the middle of the UK summer even though he was in a wetsuit - swallowed too much sea water and his electrolytes went out of balance = quick trip under blues to A&E. Thank you for commenting. The suggested method came from Jeff Martin. He admitted to not knowing whether that was a method taught in the safety courses. Sounds like you are more knowledgeable and that Jeff's method would be unorthodox and I will definitely quickly forget it. The equipment guy did step up at the end of the meeting and tell everyone to grab a ladder from the equipment room to have on board as another option for getting a sailor out of the water. I believe everyone complied. The safety team also had a system set up where a sailor would be moved to one of two larger boats near their course for triage where the best method of treatment and transport would be determined. First responders were on the triage boats as well as on shore. Jeff tended to be long winded in the volunteer meetings and described having to pull a deceased sailor out of the water at a Laser Worlds. I wish I could remember the exact phrasing. I found it odd since Doug's host at that event worked at the hospital and she kept asking (with translation problems) why they didn't just let the sailor die. Whereas Doug says they were all continually told he was alive during the entire regatta. Apparently, the day after the end of the regatta, he was unhooked from the machines keeping him alive. Now, having heard Jeff's rescue method, your cautions about the dangers of such a method and the discrepancy on whether the sailor was alive or deceased when pulled from the water ... it all gives me pause. As to the life jacket being pulled off a sailor, I really hope that everyone makes it a habit to snug up their life jacket. Decades ago, my brother and I were water skiing and he fell into the water and his life jacket was forced up over his face, pinning his arms straight up. He was in a full panic that he would drown before I would get to him. Fortunately, all worked out well but I never, never, never, fasten a life jacket on my person without snugging it up and making sure it will stay put and never come up over my head.